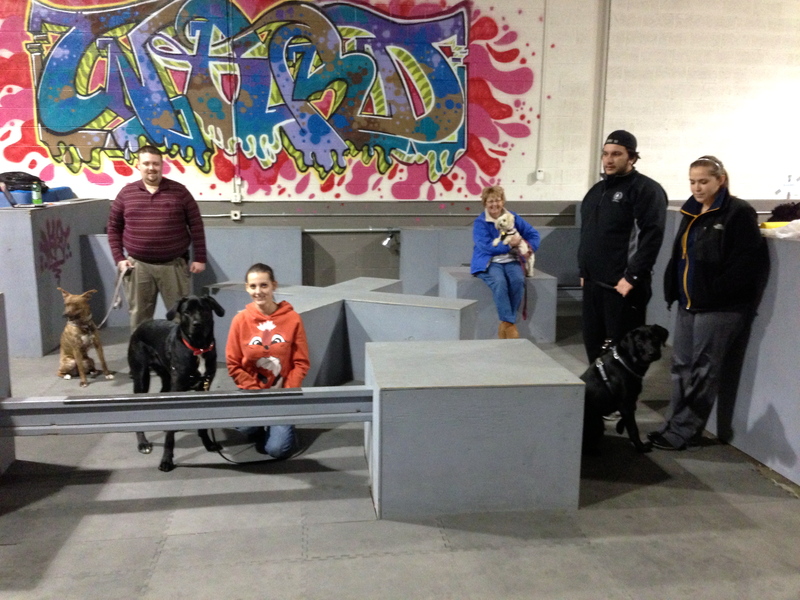 Here are the graduates of the recent “Basic Manners” group dog training class at Michigan Dog Trainer‘s Livonia training facility. The dogs made great improvements in their confidence levels in meeting other dogs and people, learned new household and walking manners and the owners learned how to better modify their dog’s behavior. The students, dogs and the trainer Michael Burkey had a blast together. The next set of group classes at the Livonia facility will start January 7, 2013. The Basic Manners class will run again as it’s a big hit in the Livonia area and fills up quickly. Additionally, the popular “Circus Class” that is normally held at Michigan Dog Trainer’s Ann Arbor training facility will be added to the Livonia location. It’s purpose is to continue the dog’s learning after Basic Manners and includes teaching dog tricks and the exercises needed to pass the American Kennel Club‘s Canine Good Citizen evaluation which is held on the last night of the class series. Both classes are held for four weeks and is only $120.00 for each series of classes. Hurry don’t delay, guarantee your dog’s space in the class. This entry was posted in Dog Class Start Dates, New Dog Training Services, Uncategorized and tagged American Kennel Club, Ann Arbor Michigan, Canine Good Citizen, Circus class, dog, dog training, group dog training classes, Livonia, michael burkey, Michigan, Michigan Dog Trainer, Michigan Dog Training. Bookmark the permalink.